Benji and Red couldn’t be more different. They aren’t friends. They don’t even live in the same town. But their fates are entwined. A chance meeting leads the boys to discover that they have more in common than meets the eye. Both of them have encountered a strange presence in the forest, watching them, tracking them. 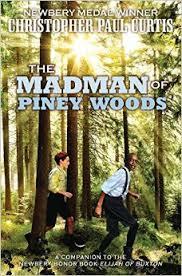 Could the Madman of Piney Woods be real? A companion to Curtis’ Elijah of Buxton. Find it on the DCF Shelf & be sure to leave your review in the comments below!